We're sorry we ran out of stock before you were able to buy. We recommend you take advantage of our Five Seed Oil until we are able to restock on Milk Thistle. It’s Known to Restore Liver Health and Slow Symptoms of Aging. How is Perfect Press® Milk Thistle Oil made? Perfect Press® Milk Thistle Oil is one of the best seed oils available in the world specifically because of the way it is made. Perfectly Pressed® from thousands of organic Milk Thistle seeds, each drop of oil is extracted without the use of heat, meaning that there is absolutely no damage to its nutritional properties. The seeds that we press are of the highest quality. They are sourced from the far western reaches of Europe and brought back to North America to have their oil carefully extracted. While the milk thistle oil is being extracted, absolutely no nutritional value is lost thanks to our proprietary Perfect Press Technology®. How do I use Perfect Press® Milk Thistle Oil? Drinking Perfect Press® Milk Thistle Oil has a whole range of benefits that start with your liver. Rubbing the oil on your skin or into your hair has a moisturizing and nourishing effect. (Be aware that if you do use it in your hair, you will need to shampoo it out). 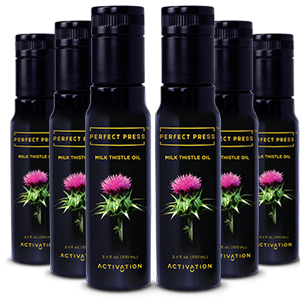 What does Perfect Press® Milk Thistle Oil taste like? 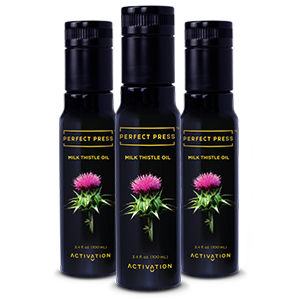 Perfect Press® Milk Thistle Oil has a smooth, malty taste. While most people LOVE Perfect Press® Milk Thistle Oil, if, for any reason, you do not enjoy the product or do not experience the results you are looking for within the first 60 days, you are COMPLETELY covered under our 60-Day Money Back Guarantee. Just call or email our friendly customer service team.